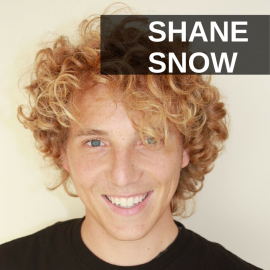 Shane Snow is the co-founder of Contently and the author of the book Smartcuts: How Hackers, Innovators, and Icons Accelerate Success. Shane Snow’s book talks on the patterns of people throughout history beating expectations and revolutionizing their industry. In today’s episode, Shane talks on the different ways you can think about ideas, problem solve, and three important questions to ask yourself when you’re trying to be innovative. [6:15] It’s risky to do things differently, but there can be a much higher reward from doing things differently in a smart way. [6:35] In the book, Shane talks about shortening, leverage, and soar. He explains what this means. [11:30] How do you become important to an influencer? [18:05] What are some of the questions you can ask yourself to think differently? [23:50] Advice for people who want to become an entrepreneur? Join a startup. Give and Take by Adam Grant. It’s my pleasure to welcome Shane Snow to the show. He is co-founder and chief creative office of Contently and author of Smartcuts: How Hackers, Innovators, and Icons Accelerate Success and I really enjoyed that book. I just finished it maybe a month ago and pleasure to have Shane on the show today. Shane, welcome, how you doing? I’m doing great. It’s my pleasure and thank you for reading. Yeah, well, it’s good to have you. It’s such a great concept. A lot of people talking about hacking, a lot of people are talking about biohacking nowadays and just hacking their way to success. In the old days they would have called it cheating, but really does it need to take ten extra years to do anything, right? If you can just figure out the secrets and get there quicker, that’s the way to go, isn’t it? Well, that’s the thing that I wanted to explore as I wrote this book is how do people throughout history who beat expectations do it. What are the patterns? And hacker as a term, right, has sort of involved in popular lexicon from this sort of MacGyver concept of finding a smarter path or a smarter way to do something into criminal activity and now back to life hacking and, like you said, bio-hacking or growth hacking. The idea is that the conventional way of doing things or the way that everyone else is working is by definition average and if you can find a smarter way of doing things, it’s often unconventional, but that can get you to success faster and with what I was looking at is not shortcuts where you’re taking value away or you know, I always say buildings fall down when architect take shortcuts, but smarter ways of doing things that provide more value, but just get you there quicker. Well, that’s certainty true an certainty a good point, so in the book I remember you starting off with gaming and Super Mario Brothers, I believe. Give us some examples of some of these great hacks by great innovators. You know, one of my favorites is when there’s a children’s hospital. I write about this in the book. Children’s hospital in England that was having this problem of kids were dying in the recovery room and they couldn’t figure out how to stop this problem. It’s because they would operate on a child, do a heart surgery, then they’d move them to another bed, run them down the hallway, and then move them to another bed and plug in all the stuff again in intensive care unit and there were all these problems that were happening in those transfers where they just try as they could. Information was being lost. There were technical errors and what they tried doing is what most of us would try doing. They looked at best practices of what do other hospitals to do successfully do these hand offs between the different rooms and to get these kids to recover well and they couldn’t make improvement – made very small improvement until they looked – a couple of doctors sat down one day and turned on the television and saw the Ferrari team for the Formula One do a car, basically, pit stop, very quickly, and they realized that a bunch of guys huddled around a car tearing off tires and refueling it in a few seconds was very similar to a bunch of doctors huddling around an operating table, you know, pulling off ventilators and attached monitors and tubes and things. And so they invited themselves down to Italy to learn from the Ferrari pick crew on how did they do this complex process very quickly and safely. Then they brought the pick team up to London to help them re-choreograph their routine and they were able to reduce the number of errors at this hospital by something like 50% over night and basically the smart cut there, the hack was don’t learn from your peers that are so ingrained in the way things are done in your industry that if you want to make break through change, often you have to look outside your industry. Take a sidewise step, you know, look for inspiration in other places and you actually see that same pattern over and over again. So, it’s this idea where we’ve hit the creative plateau where either we’re solving problems or we have metaphorical writers block rather than just looking at the people you aspire to be, look at people outside your field and you’ll come up with ideas that will help you surpass those people that you aspire to be. Yeah, I think that’s a great idea. You know, that pit stop concept is such a good one. I remember years ago I suggested that idea to a friend of mine who owned a car wash and I never really understood. Now I’ve seen a few more car washes doing it this seemingly, to me, smarter way, why is it that there’s – it’s the same amount of man hours, if you will, right. If one guy is going to vacuum and then they’re going to send the car through the machine and then it’s going to come out the other end. The other guy is going to, you know, do the windows and wipe off the dash board and all that kind of stuff and wipe down the console and the inside. Why is it that you just can’t have all that done on the back side of the car wash after it comes out of the machine and have, you know, two or three people. As long as they’re not tripping over each other, the pit crew concept makes a lot more sense. It just completely makes sense and she implemented that and it seems to be working great for her car wash.
That’s great. Well, when you ask why, why not, the reason that usually people give is because that’s not how it’s done and that is sort of the enemy of innovation and it’s certainty the enemy of break through progress, right. This is the way its done very rarely gets you to the point where you’re so much better than your competitors that you win their business or that you are making so much improvement that you take your business to another level. That doesn’t happen if you stick to the same thing and that’s the thing that people worry about. It’s risky to do things differently, but it’s also, it can be a much higher reward if you do things differently in a smart way, not just to be different, but a smarter way. Yeah, so no question about that, Shane. So, in the book you decided it into these three parts. One is shortening, leverage, and then soar. Tell us about those three parts, if you will. What I looked for – I went through kind of the tour of the history of business and arts and science and I looked for break through and I looked for kind of these overachievers that managed to do things in incredibly fast amounts of time and basically tried to do a regression analysis. What are the patterns in the way of thinking that these people throughout history have done and there’s a lot of contemporaries and some from a long time ago and overall, there are sort of three main types of hacks or smart cuts and the first is finding a shorter path or making the number of steps between you and success fewer. The second one is amplifying the effort that you’re already making. So, leverage, the idea of using the lever to lift up a heavy object requires a lot less muscle power. It’s a smarter way of doing things and then soar is this idea of doing things, adding, I guess, radical constraints or radical expectations in order to do things that have world class levels, so kind of once you’ve engineered a smarter path, once you’ve maximized the bang you get for your buck, then how do you take things to another level and really, those are just kind of the themes that chapters themselves are about individual either myths around success or common pieces of advice around accelerating success and sort of a little bit of myth busters between research and stories where, you know, when we’re talking about shortening, talking about common success advise around paying dues or finding mentors or Lean Startup fail fast, fail often, and explore how to exploit those ideas in order to make the path to whatever you’re trying to do shorter. The second part with leverage, I talk about leveraging platforms for, how to use technology, how do you approach using technology or sort of technology alternatives to not reinvent the wheel. How do you ride waves and use pattern recognition to basically let markets push you. What’s the smarter way to use networking an connecting with humans to accelerate your success. So, the idea is that you can make a 1,000 friends or you can make friends with the person with a 1,000 people that trust them. The second is a lot faster and can be a lot more effective, but how do you do that? What are sort of the secrets of these over achievers through history and leveraging networks of people and it kind of goes against the common advice of – well, the common advice is not what you know, it’s who you know, but normally when you talk about networking, you’re handing out business cards at events and being persuasive and learning how to sell people. The smarter way of doing that is flipping that on its head and figuring out how to give people and then the question is how do you give to the people that have everything, that have the biggest networks and so on. So, this is the kinds of questions that I address to those and then in soar I am talking about how world class successes that managed to get where they are very quickly, but keep sustained success and keep growing, how they use momentum, this idea that momentum is a better predictor of success than anything else and is incredible at getting people to come join your cause and I talk about radical simplification and how, you know, Apple and Picasso and these great innovators make things simpler and how that can take you to a new level and then I talk about ten x thinking, which is really around this idea of if you shoot so high that you have to break everything about your business or your plan. It forces you to step outside of the conventional path and this is what amateur rocket scientist and world class, you know, successes in various fields in places like Google, how they think they don’t think. Let’s make incremental progress. They say, what if we had to do it ten times better, what do we have to change. So, those are kind of the ways I break up the book, but it’s all around these patterns of different ways of thinking about problems. By the end, it becomes this sort of almost a check list of things you can say if I were to apply this principle to this problem, what would I have to do? Yeah, no question. So, I remember the example in the book of make a thousand friends or just friend someone with a thousand friends. In other words, for entrepreneurs for anybody who’s got a message to get out. They are, so, virtually everybody nowadays is a publisher of some sort I want to say, because we all want influence and at the most personal level that’s done on social media and in person interactions, but everybody does a speech occasionally or gets in front of a group. You know, you’re really just leveraging someone else’s network, someone else’s audience, so maybe two keys that you did allude to there are – to answer the question for us, if you would, Shane, how does one do that? How did they, I guess, become important to that influence, so that they can leverage that person’s audience and how do they get mentors? Everybody wants to have a good mentor of course. You know, saying, hey, will you be my mentor is definitely not the way to approach it. Because you’re not offering anything. It sounds like it’s just a demand on my time and who has time nowadays, right? What are some of those techniques if you drill down on them? Yeah, so the question that I asked when I started exploring this. I talked to networking gurus and people who had been listed as the ‘best networkers in America’ and those types of folks and I also explore a lot of networking theory and some of the really good academic research about success based on your connections and networks and the old school advice was that, you know, sell yourself, hand out your business card, ask people to be your mentor, the problem is. The question that I asked everyone is say I wanted to get to Richard Branson, you know, I want him to help me out some how or connect me to his millions of people that follow him and trust him. What do I got to do? The first answer that you get is, you should probably rethink whether Richard Branson is the ideal person to help you, first of all. He’s very busy, but he may be at a level where he’s not accelerating as much as maybe you want the person that’s kind of underneath him. So, that’s the first question, just rethinking is that person that you’re targeting really the right person? But say it is, then what does a billionaire like Richard Branson need. He can buy anything he wants. The better question is what does he care about and even better, who does he care about. The best way to get the attention and evenutally the help and sort of the network of someone with a big network who is important or indemand is to help the people that they care about or help them help the people that they care about. So, everyone like Richard Branson has a charity or causes that they care about. They also have an audience. One of the best ways to, what I call, super connect is to give these people content or information or material that can help their audience. So, a real life example for me is Tim Ferriss, the author of The Four Hour Work Week. He has this massive audience. A lot of people who read books like mine and he’s known for being this guy that sells books. So, long before I wrote my book, I really wanted to connect with Tim. He’s in the universe of people I would love to have kind of on my side, but you can’t just email this guy and say, hey, would you promote my stuff or hey, let’s be friends, because he’s really busy and in demand, so the way I became friends with Tim is I emailed him with a story idea for his blog and I said, I basically I had this great story that I was going to write for Wired magazine, where I normally right, but instead I went to Tim and I said, hey, I have this great story idea that I think your audience is going to appreciate and it ended up being something that was a good fit for his audience and what his concerned about at his level is feeding the people that are his fans with stuff that can keep them around as his fans and keep that relationship alive. So, I helped him build his relationship and maintain his relationship with his fans by giving him material to feed his fans. In this case it was in the form of a guest article and I did this for him – it can’t be self serving. It has to be helpful, right, and I did this for him a few times and this is how I developed a relationship with Tim, by helping the people he cared about it. So, the point when my book was coming out, he was more than happy to take a look or let me, again, guest post an exert from my book so that I can expose his audience to what I was writing about. In every case there was never a sort of, there was never an ask that was like, hey, promote this thing, help me make money. It was always around this idea of let me help your audience and therefore you and that’s how we built a relationship, but I think that’s the strategy and when you look at the academic research about who are successful at networking, the people who get the furthest are the ones who are givers. There’s this great book by Adam Grant who is the professor at Wharton called Give and Take. It’s all about the research around people who are givers getting further, whether it’s in networking or their fields. The better strategy rather than asking and selling is to sell provide value and if the person has a billion dollars, provide value for the people that they’re trying to help and that’s the better way to make connections. When you talk about, to any of these networking gurus now, these super connectors, the first thing that they say is that their job is to help other people first knowing that builds up karma and a fan base and allows them to create a community around themselves that can then help them and so that’s kind of the strategy that ends up happening. In the book I talk about the Cuban revolution was won so quickly through this idea of using the radio and then helping people learn how to do their jobs and everything better rather than trying to convince them to pick up arms and fight the government. Right, right. I remember you talking about Che Guevara. I wish people didn’t worship that guy, though. He wasn’t a good guy. Every time I see someone wearing one of those stupid t-shirt I wanna go and say do you realize what this guy day? I mean, Castro wasn’t good either. That’s the Hot Topic generation that’s certainty taken that guy, but the point of it is even, and that’s one of the things that I wanted to explore in the book is good guys and bad guys.. Exactly and hopefully we can use them for good. Right, absolutely. That really kind of answered the getting the mentor question as well and it’s a great example about Tim Ferriss and you know, Richard Branson, I was going to say, I have the good fortune to go to Necker Island and hang out with him once. You could just give $25,000-$40,000 to Virgin United and go to Necker Island and hang out with him too, but that’s kind of an expensive way to go. Very interesting. Okay, so, what else, what other, like, hot techniques do you want to mention? You’ve got, you’ve got this three sort of major parts and you’ve got three subcategories in each and I just thought I’d leave it open to you to whatever you think is important. I’ve been doing a lot of corporate speaking lately and the things that have resonated a lot with businesses in the speaking that I’ve done have been kind of around this idea of what are the question that you can ask yourself to spur this lateral thinking, this hacker thinking. How do you train yourself to think of things that you wouldn’t normally think of, right? It’s sort of a circular question and the three things that kind of emerges as themes out of the book come from, you know, the first chapter and a couple of the last chapters, but it ends up being an overarching theme. This the idea of seeking sideways inspiration that I talked about with the race car drivers and the doctors or taking sideways when you hit the ceiling or you hit the plateau, look sideways to see where you can sort of pivot, so to speak, or asking yourself, how would someone in another, who is very unlike me handle this? How would a ballet dancer approach this problem? How would a firemen approach this problem?How would x company that’s not in our space approach this problem? That’s the first one, that sideways thinking. The second one is this idea of radical constraints. One of my favorite question to ask when you’re building a product or when you’re working on a problem is what if we had to do this for 100 times cheaper. When you ask that question, it forces you to really think about what’s not only – basically to really think about what’s good and what’s essential. Right, right. It’s a great part of like the Lean Startup methodology. I love that, because you saw in the last dot com bubble, you know, 1999-2000-2001, that era. All these dot com companies having money just thrown at them by VCs and it ruined them! It’s kind of counter intuitive that having a lot of money could be bad, but it really can, right? Right, having fewer resources forces you to be more creative is really what it comes down to and that creativity is what gets companies to be a step function better than their competitors. If you have money to do everything, you’re going to do everything and you’re actually going to end up sort of regressing towards the mean, you’re going to copy everyone I’m trying to do, what they’re doing, a little bit better using your money, but then this is why you see small companies all the time disrupting huge companies, because they don’t have the resources or the luxury to do things the way it’s supposed to be done, so they have to do things in a hackery kind of way. The reason why I like the question of 100 times cheaper is that it’s so dramatically cheaper that you can’t just make things more efficient. You can’t just optimize. You have to rethink. So, that’s one of my favorite questions. The other question that I alluded to earlier is this question of asking yourself what if we had to do this ten times better. Not just ten percent better, but ten times better and that is a different angle at the same goal, which is breaking the assumptions, the breaking the norms or the conventions of the way things are normally done or even in your business or in your industry, because in order to get ten times better, you can’t, again, you can’t just optimize or make things more efficient or cut costs. You have to rethink the fundamentals of the way things are done. So, we actually have this thing that we do at Contently, at my company, every once in a while where we’ll sit down and we’ll talk some aspect of our business and we’ll ask that question, what if this had to be ten times better, then we’ll define well, what does better mean, you know, in this case, but then we’ll, you know, the discussion leads to, you know, what will we have to break, what would we have to get rid of, who would we have to fire, who would we have to hire, what would we have to spend, what would we have to do, how do we have to re-engineer our way or re-orient ourselves around this problem in order to get to ten x and some of the stories that I ended up funding for the book. The main story, the story of SpaceX, you know, the space company that..
Sure, Peter Diamandis and so forth and the X Prize that sort of launched that whole revolution. Yeah and how do you do, how do you get to space is a really hard problem, but part of what allows SpaceX to become the first private space company to get there and to do all the incredible work that they’ve done is their goal wasn’t reducing the cost to get into space, the goal was to put life on Mars to put the human race on Mars, which is so big that you have to really, really, really rethink the entire process of getting to space. So, those are my three questions. You know, how can you think side ways; what if we had to do something that was a step removed to the side of what we’re doing? What if we had to do this 100 times cheaper? What if we had to do this ten times better? Those questions are probably the best frame work for brain storming for problem solving or making your business better that I can think of. I think that’s definitely a great idea to really look at the whole fundamentals content. I mean, back in the days before the automobile, were people saying, well, how can we get a faster course? How can we get them to go faster? You know. It’s just not the right question. You have to ask a whole different question. It’s funny we still use the word horse power, right. I know. That is. It’s very funny. Very interesting. Shane, give out your websites and tell people where they can find both your company and then your author site, if you will. So, my company is Contently. Contently.com. We help brands become publishers and we do a lot of education for content marketing, which I think a lot of the audience here is probably thinking about, because it’s a big buzz word. So, Contently.com and then all of my stuff is just my name, ShaneSnow.com. You can find links to the book and all of my writing and everything there. Fantastic. So, in terms of a start up business. Everybody’s walking around with a business idea in their head, you know, maybe they have their own business now, maybe they have a corporate job and they are working in a cubicle and they hate it and they want to try doing something on their own. Any more advice that you can give someone who wants to do a startup, someone who wants to become an entrepreneur and get out there and, you know, we talked about thinking differently from a different context, that’s all great, but just any other thoughts on that before you go. Yeah, there’s a couple of things. One is that if you want to do that, but you’re unsure how or you’re nervous about it, the best thing you can do is join a startup, you know, because an early employee, even if you’re underpaid, at a company that’s really fighting the up hill battle as a startup and you will learn so much in a year versus kind of any other education you can get. This is part of what inspired me to do a startup is, I wrote about startups and that inspired me, but back when I was in college I interned at a startup and that was when it clicked for me that, you know, you learn all of the things. You see everything really raw and up close. That’s when it clicked for me that I wanted to do this and also you learn a lot of lessons from that. So, that’s the first thing is if you’re not quite there yet, join a startup, you know, quit your big job and join something small and scary and then start your own thing. The other thing too is and this might be common advice, but too many people wait on the idea or they talk about the ideas that they have or they are nervous about it and the don’t take that plunge. I think one of the best things you can do is jump in with both feet. Save up a little bit of money or I guess I shouldn’t advocate getting, you know, credit cards out, but jump in on the thing that you’re doing. Build the thing that you wanna build and if you’re cash constrained then that constraint actually could be really great like we talked about. Create the thing that you want to create rather than sitting around planning or talking about it or sort of looking for someone to help you build it. That’s, I mean, that’s the biggest thing and that’s the pattern with any of these people that I write about even is that they are doers not just, you know, there’s certainty the smart worker. There’s also the hard worker of getting out there and actually jumping in. Like I said, it’s common advice, but it’s really the thing that makes the difference between people that make things happen and don’t is people that make things happen, they just jump into it. Yeah, no question about it. I like to say cultivate rational recklessness. You know, you gotta be just a little bit reckless, not too much, obviously, that’s not prudent, but you gotta just kind of go for things. I mean. History books are replete with examples of people who did crazy things that worked out and nothing ventured nothing gained as the old saying goes, right? Wear a helmet, but get on the bike. Good way to put it, good way to put it. Shane Snow, thank you for joining us.